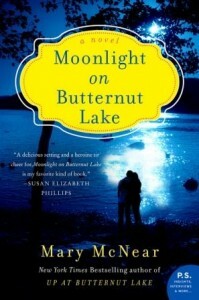 Mary McNear lives in San Francisco with her husband, two teenage children, and a high-strung, minuscule white dog named Macaroon. 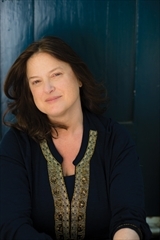 She writes her novels in a local doughnut shop, where she sips Diet Pepsi, observes the hubbub of neighborhood life, and tries to resist the constant temptation of freshly made doughnuts. 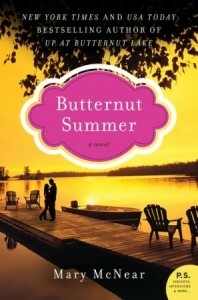 She bases her novels on a lifetime of summers spent in a small town on a lake in the northern Midwest. It’s the little details that make or break a book for me. 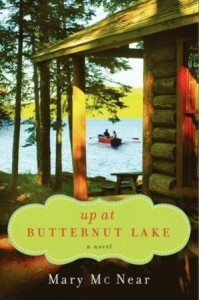 On the surface, Up at Butternut Lake may seem like just another contemporary romance. It’s got the cute small town setting, the strong women who are going through personal struggles (two of them, actually, Allie, and Jax) and the newcomer who still has ties from out of town. But that’s just the surface, and it would be a mistake to write this book off just because it includes a few common tropes. Then there’s Allie herself. She’s at the lake in part because it’s a personal haven for her, full of good memories, but also because, having lost her husband, she wants to be in a place where she can rebuild trust in herself, without the often-stifling offers of help. She isn’t a misanthrope; she just needs to find her footing. These are the sorts of details, details of plot, setting, and character, that Mary McNear has given us in Up at Butternut Lake, and this is why it’s not ‘just a romance’ but a story about strong women, and the people whom they love. Goes well with Sweet tea and strawberry-rhubarb pie. 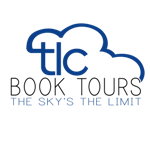 This review is part of a virtual book tour hosted by TLC Book Tours. For more information, or to read the entire list of tour stops, click here.